New restaurant opening soon in place of former Indian eatery. 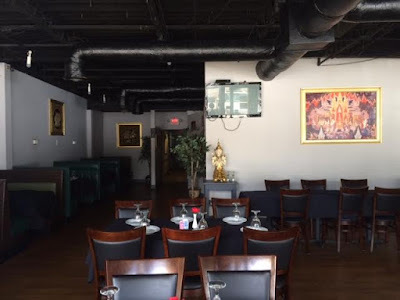 The owners of Mint 2 Thai-Sushi plan to open "Best Seafood & Noodle World" in the coming weeks in place of Bhojanic's shuttered Decatur location. Bhojanic, the popular Indian eatery, closed its original location on Clairmont Road in Decatur this past November after twelve years in business. Bhojanic's Buckhead location, which opened in 2013, remains open as does a recently launched mini version dubbed "Bhojanic Market" at Cox Hall on the campus of Emory University. Best Seafood & Noodle World will feature a menu consisting largely of assorted noodle dishes as well as oyster and crab offerings. 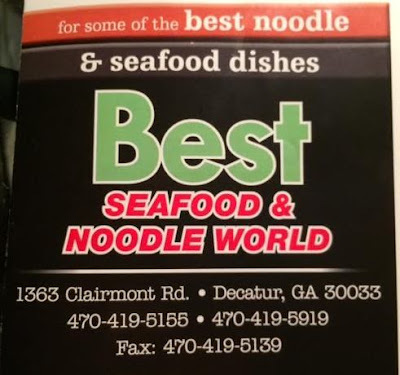 Ba-Mee Moo Dang (BBQ pork with egg noodles, spinach, cilantro, bean sprouts and chopped peanuts), Chicken Noodle and Shrimp Noodle soup are among the noodle options. Various Vietnamese Noodles (Pho) will also be served. Seafood offerings will include Shrimp Mermaid (Shrimp wrapped in rice paper skin deep-fried and served with sweet chili sauce), Crispy Calamari and Crawfish are among the planned seafood options. When I visited the spaces earlier this week it looked very close to opening but signage on the door indicated management was still looking to hire a bartender. Are you a fan of Mint 2 and excited to see them expand? What 's your favorite noodle dish? Have you been to Noodle World's neighbors, the revamped Villagio Gastro Italian or Mason's Tavern, if so, what were your thoughts? Please share your weigh in below. Mason's Tavern is a really nice place. The service is great. They have a nice selection of beer (lots of local choices) and the food is good too. The space itself is also very warm and comfortable. I hope this place lasts in what seems to be a not great spot. Mint2 is garbage. Seriously bad food. I don't understand how they're even open. I agree, Mint to whatever level of success they're enjoying, has to be completely by accident. Their second location much further up Claremont is in the most awful nasty shopping center that is three steps below Third World. The food is absolutely horrible filled with onions and fillers and Lord knows where the meats and seafood really come from. I see they are gone now and Apples Asian House is in its place. Are these the same owners?